The globetrotting star, Snow Fairy, has lost her race against time to be fit for the Prince of Wales’s Stakes at Royal Ascot and will not make the starting line-up for the showcase mile-and-a-quarter contest on June 19, the second day of the big meeting. Well fancied for the Group 1 event, despite not having raced since September last year when beating the high-class Nathaniel in a memorable renewal of the Irish Champion Stakes at Leopardstown, Snow Fairy had been reported to be working well ahead of her intended seasonal reappearance. Generally on offer at just 7/2 for a race that will likely include last year’s dual classic winner, Camelot, French star, Maxios, and the rapidly progressive Al Kazeem, the six-year-old has sustained a minor training setback, meaning that she won’t be fit enough to face the starter at Royal Ascot and will have to begin her fifth racing campaign later on this term. A series of minor injuries have plagued the bargain basement buy (1800euros) in recent years, limiting her racecourse appearances to just two since November 2011. She showed on both those occasions that she retains just about all her considerable ability, her victory over Nathaniel and her ‘win’ in the Prix Jean Romanet at Deauville in August 2011 showing that the winner of eight of her 21 career starts and more than £3.9 million in career prize money is still one of the best middle-distance racehorses on the planet. 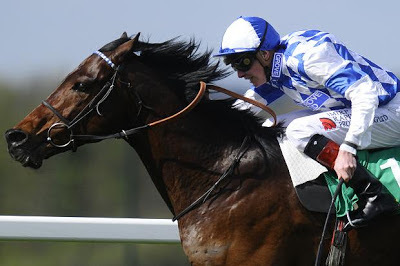 Al Kazeem is now the general 7/4 favourite for the Prince of Wales’s Stakes following his win over Camelot in Ireland last time out, Aidan O’Brien’s star being available at 9/4 on www.betfair.com/sport to gain his revenge in what promises to be a great race.